The State Natural Resources Board is expected to take up proposed changes to how the state manages Chronic Wasting Disease in the deer herd. The Board is scheduled to vote a proposal Wednesday, during its meeting in Hayward, which would change the focus of how CWD is being fought in the state. CWD project manager Davin Lopez says the new five year plan would focus more on containing the disease, rather than trying to eradicate it. 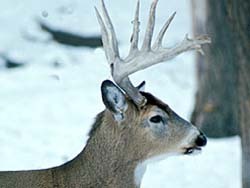 The DNR has been fighting to keep the neurological disease from spreading among the deer herd since it was first identified in 2002. Lopez says they&apos;ve been unable to determine how effective those efforts have been, largely since the only way to guarantee CWD will be eradicated would be to also eradicate the deer population it could spread to. Lopez says the plan is expected to face opposition, since opinions on how to deal with CWD vary widely.